Third Place Commons is delighted to announce the start of our new, summertime music series, the Sounds of the Season, taking place on the first Friday of every month from June through September. Summertime is the season of backyard barbecues, fireworks, road trips, and sunny days. And what could be a better soundtrack for the season than the folk, country, and Americana that four fantastic bands will bring to the Commons all summer long? Third Place Commons offers free, live music every Friday and Saturday night at 7:30 pm (dancers welcome!) as well as hundreds of other free events throughout the year. Check the online calendar for the full schedule and follow us on Facebook to keep up with all the latest. Naturally, there’s more great music throughout the month in June. From the high octane fun of Stickshift Annie with Kimball & the Fugitives (June 3) to the toe-tapping tunes of the Market Street Dixieland Jass Band (June 9)… from the guaranteed swing of the Two Scoops Combo (June 17) to the quirky charm and silky voice of Kate Voss and the Big Boss Band (June 23)… from the R&B classics of Little Bill and the Bluenotes (June 24) to the seismic blues of the Fabulous Roof Shakers (June 30).. . Whatever your musical tastes, June will not disappoint. So head to the Commons for fantastic music all month long! You know what else is fabulous in June? The Secret Gardens of Lake Forest Park Garden Tour & Market is a beloved annual tradition, one of our biggest events of the year, and it takes place on Saturday, June 18th. Six gorgeous private gardens open their gates for one day only. The Garden Market serves up a dazzling array of plants and garden art. Plus each garden features live music, artists, and master gardeners while celebrity gardening expert Ciscoe Morris holds down the fort at the market from 11-1. It’s a not-to-be missed event, and you can save $5 per ticket when you buy your tickets in advance! Visit the Garden Tour website for all the details and join us! And don’t forget about the Farmers Market! Of course, summer always means market around here and the Lake Forest Park Farmers Market is officially in full swing. Join us every Sunday rain or shine, 10-3, for an amazing selection of fresh, locally grown and produced fruits, veggies, meat, fish, cheese, eggs, pasta, bread, jams, sauces, wine, coffee, baked goods, sweet treats, and more. Plus gorgeous fresh flowers and special guest vendors early in the season until all the produce arrives. Nothing but the best at the market, so join us every Sunday see how good it is! 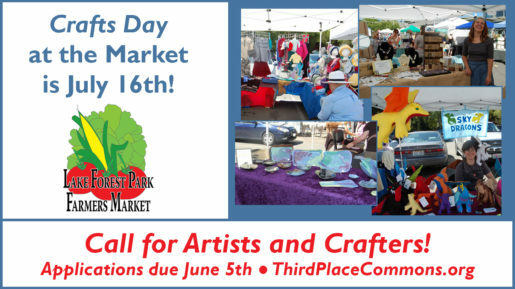 Our once-per-summer Crafts Day at the Market takes place this year on Sunday, July 16th and all applications must be received by Monday, June 5th. If you’re an artist or crafter with creative endeavors you’d like to sell at our market, download the LFP Farmers Market _Crafts Application Summer 2017 and get that application in ASAP! Previous Post: Farmers & Flowers & Food Trucks, Oh My! Next Post: Gorgeous gardens, art, crafts, music, and more!